Western conifer seed bugs are native to the west coast. They started showing up in eastern states in the 1990s, and are now quite common here in Massachusetts. You can find these bugs congregating on the sides of buildings, on doors and on window screens, where they are hoping to find a way to sneak inside. They are particularly attracted to buildings that receive a lot of sun or have light-colored siding. There does not appear to be any significant impact of this pest on the natural environment (adults don’t eat at all; the young eat the seeds out of pine cones) however, as home invaders, they can be quite the nuisance. If they find their way into a structure, they sometimes gather by the hundreds, and can be found wandering around homes and other buildings whenever there is a burst of warmer weather in the winter or early spring. As an additional nuisance, though they are not true stink bugs, Western conifer seed bugs will release a “stinky” liquid when startled. The easiest way to tell if you’re looking at a Western conifer seed bug is to check the back legs. These bugs have wide, flat flares on their back legs, reminiscent of bell-bottom jeans. You can also look for a thin, zig-zagging white line across the middle of the bug’s body. 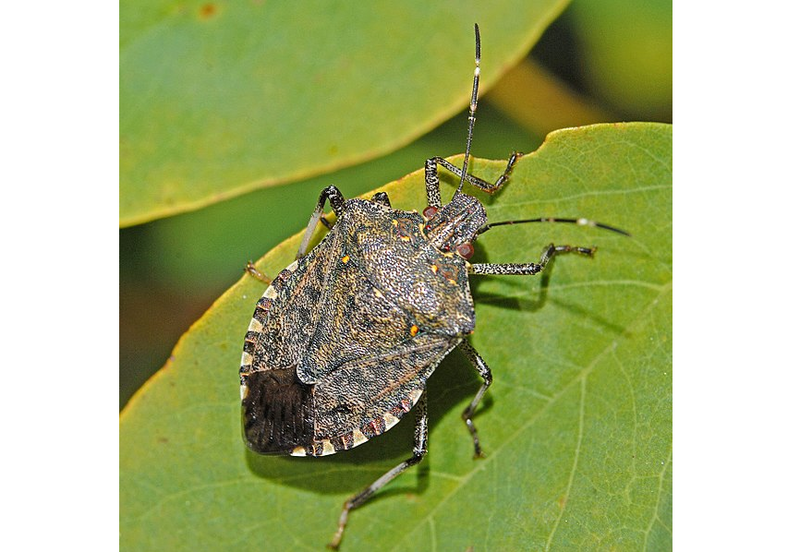 The brown marmorated stink bug (BMSB) is an invasive species that was accidentally introduced to the US from Asia in the 1990s. In some states, the BMSB infestation is so bad that homeowners are dealing with hundreds, or thousands, of these bugs crawling all over their houses. The first brown marmorated stink bug found in Massachusetts was captured in the town of Bridgewater in 2007. Since then, BMSB has been recorded in several towns and cities across Massachusetts; though appears to exist only at low levels here. A monitoring program run by UMass Extension reports no more than a few insects have ever found at a single location in our state. BMSB and Western conifer seed bugs can be easily confused, especially by non-experts. All reports of large infestations of “stink bugs” in Massachusetts have actually turned out to be the Western conifer seed bug. While these insects are both brown with a similar body shape and both emit a “stinky” liquid when startled, BMSBs lack the “flare” on the back legs that the Western conifer seed bugs have. They also have a rounder, more compact body marked with tiny flecks or “marbling” and antennae marked by two distinct, light-colored bands. Unfortunately, BMSB is also a home invader, seeking warm spots in houses or other buildings to hibernate for the winter. Unlike the Western conifer seed bug, BMSB is a major agricultural pest. Like most stink bugs, this pest feeds on plant juices, with individuals jabbing their mouthparts into apples, peaches, plums, corn, tomatoes and virtually any juicy fruit or plant stem the bugs can find. In states like Pennsylvania and Maryland, where BMSB infestations are large, this pest has devastated crops, costing farmers millions in lost fruits and vegetables. To combat this burgeoning problem, researchers are working to develop a biological control, a tiny wasp that attacks BMSB and could help keep infestations at bay. The multicolored Asian lady beetle, what many folks commonly call a “ladybug”, is an Asian species that was intentionally introduced to the US starting almost 100 years ago, as a biological control against aphids, scales and other garden pests. Over the years, Asian lady beetles have become well-established throughout the country, reaching such levels that their winter behavior of seeking out warm places to hibernate is seen as a nuisance. These beetles are yet another insect you can observe swarming the sunny sides of houses in the late fall, with homeowners often complaining of having them piled by the hundreds in windowsills. Some individuals have even developed allergic asthma as a result of exposure to heavily infested homes. The impact that these high numbers of non-native Asian lady beetles are having on the environment remains unknown, though researchers have noted a drop in native lady beetle populations as Asian lady beetle numbers have risen. There is concern that these two observations could be linked; see “The Lost Ladybug Project” at http://www.lostladybug.org for more information. If you are having issues with these or other insects invading your home, the most important thing to do is to ensure that any possible points of entry are sealed up. Repair holes in window screens, fill in gaps in window and door frames and cover or remove wall air conditioning units. For heavy infestations, consult a pest management professional.